This is the 6th in my series of re-prints of Behind the Scenes articles from Fame'd Magazine. Sarah Murray is someone I actually knew BEFORE I started writing. We met when my daughter was in her late teens and doing a little freelance modeling for her. 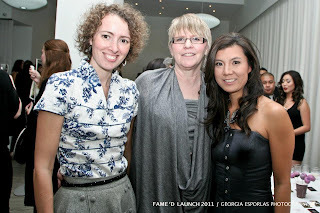 Later, when I became editor of Fame'd, her press releases kept me apprised of new local designers to consider as well as events like the Generation Next competition she was involved with for several years. While Murray brings strong organizational skills to every project, her greatest talent in my opinion is a diversity of unique ideas that are totally outside the box. Offered is a fresh approach to the mundane and expected. A great example is the year she guaranteed my attendance at a school show by having one of the students deliver my swag bag the day before - right to my door. How could I turn that fresh, eager face offering a personal invitation down? So without further ado, here is my article on Sarah Murray published in Fame'd Magazine in March 2012. Enjoy! Sarah Murray's resume says it all – teacher, show producer, public relations, writer, editor and much, much more. The fashion world first beckoned in university and there was no turning back. Add in a deep felt commitment to the Eco Movement, a gentle, quiet spirit and a passion for our Vancouver community and a picture begins to emerge. She is a champion on the local scene working daily to change the way we view fashion, one step at a time. Ont he way to a show with model Zara. 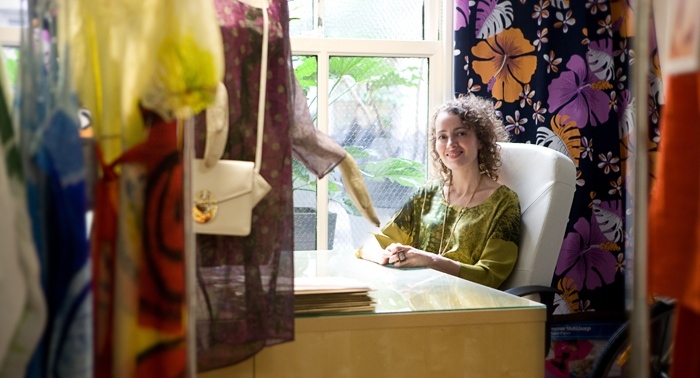 Over the last several years, Murray has also made her mark on the local scene through teaching and producing innovative fashion events. Several stand out. Generation Next supported local up and coming designers from 2005-2010. Winners included Nicole Bridger, Red Jade (Peridot Kiss), and Sofia. For Capers Organic Market she challenged designers to create a garment inspired by or featuring food. The result – handbags made from corn husks and a wheat grass dress. Another event had models on stage playing musical chairs with the audience betting on the winner. For the Vancouver Home Show in 2010 – models came out with home décor props to set the stage in colours that matched or complimented their garments. Each new event is a chance to explore original ideas to draw the audience in. Next on the list for Murray is a conference/showcase in May called Bcreative 2012. This event brings together government, business, the creative sector, and researchers to stimulate thinking, policy and action directed at developing a strategy; lever resources to further build the creative economy; and help BC become a leader in the creative sector in the twenty-first century. Murray will be working with Vivienne Taylor, Jun Ramos, Katherine Soucie, and RozeMerie Cuevas to bring attention to the fashion industry as an important part of Vancouver’s creative economy. Bcreative 2012 is a must attend for anyone in the local fashion scene and Murray's participation is just one of the ways she continues to support our Vancouver community. For more information on Fashion Capsule or to contact Sarah Murray go to www.fashioncapsule.ca.